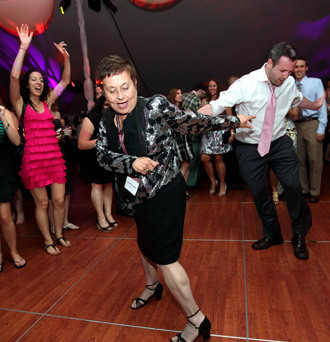 Fordham alumni converged on Fordham’s Rose Hill campus from June 1 to June 3 to reconnect with classmates and recall a formative time in their lives that, for many, remains wondrous. “They were the happiest days of my life,” said John Klammer, FCRH ’68, relaxing in front of Walsh Library and taking in what he called the “timeless setting” of the Rose Hill campus. 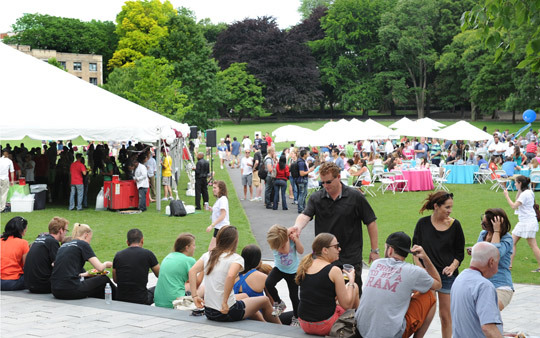 More than 1,600 alumni and friends came to campus for the Jubilee 2012 reunion weekend, attending various galas and special events, and making gifts that added up to a preliminary total of approximately $12.8 million. In his welcome address, Joseph M. McShane, S.J., president of Fordham, described Fordham’s ascent as an academic center: its tripling of endowed professorships in the past nine years, to more than 60; its regular acknowledgement as a top producer of Fulbright award winners; and its surge in national and international rankings, such as its 31-place jump, to No. 53, in the U.S. News & World Report rankings over the past nine years. He urged alumni to be the University’s ambassadors. 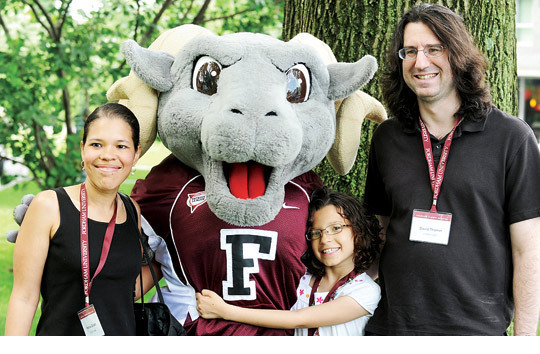 “Tell the [Fordham] story from your heart,” he said. 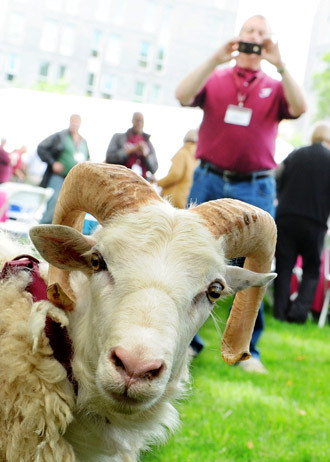 Alumni shared stories that revealed the special flavor of the Fordham experience. 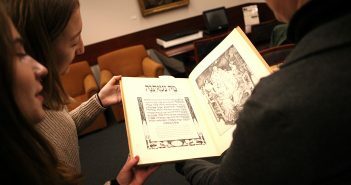 Klammer recalled the classes and trips to the city’s many museums that helped him realize his passion for visual art. One of his contemporaries, Kenneth Phillips, FCRH ’67, said the high-quality education he received still has an emotional tug. “Coming back here is always nice for me. It allows me to reconnect with that part of my life where I started to understand what was happening in the world,” said Phillips, a semi-retired software entrepreneur who was the first in his family to attend college. Jennifer McCaul, FCRH ’97, recalled walking to her work-study job at a homeless residence in the wee hours and seeing a man following her, whom she later learned was one of a few local residents who had decided to watch out for her. “I was not blending in on Webster Avenue at 5 a.m.,” she joked. Arthur Carine, PHA ’61, remembered the rigorous curriculum at the College of Pharmacy. “You want to know something? It prepared us well,” he said, after touring the college’s former home, Thebaud Hall, with other pharmacy alumni. Jeanne Fisher-Thompson, MC ’72, a retired higher education development professional, received the Alumna of Achievement Award for outstanding professional or volunteer achievement. Dianne Kollar Monticone, Ph.D., MC ’62, former professor of foreign languages at the College of St. Elizabeth in Morristown, N.J., received the Golden Dome Award for continuous service in the advancement of Marymount College. Margaret Ellen Flannelly, R.S.H.M., MC ’57, a former dean and vice president at Marymount, received the Gloria Gaines Memorial Award for service to one’s church, community, and the college. Two honorary alumnae were inducted: Elisa Carrillo, Ph.D., GSAS ’53, and Rosemary DeJulio, Ph.D., GSAS ’90, GSE ’00. Carillo spent most of her teaching career at Marymount, from 1945 to 2000. “It has been my privilege and my fulfillment … to have helped mold, and in turn to be molded myself, by the Marymount graduate, and hence my pride in entering your ranks as an alumni,” she said, drawing a standing ovation. DeJulio, assistant to the president of Fordham, recalled the warmth of the Marymount community during her tenure as assistant dean of the college, one of many administrative posts she has held at Fordham. “During my time at Marymount, I was indeed made to feel very, very welcome, and befriended by many faculty and staff alike,” she said. Her husband—Tom DeJulio, Fordham’s general counsel—noted the important role she played in helping Marymount students assimilate into Fordham’s undergraduate colleges and schools when Marymount was closed and merged with Fordham. 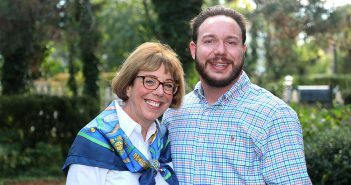 “[I’m] delighted that the work that she did at Marymount College is being recognized in this fashion,” he said.